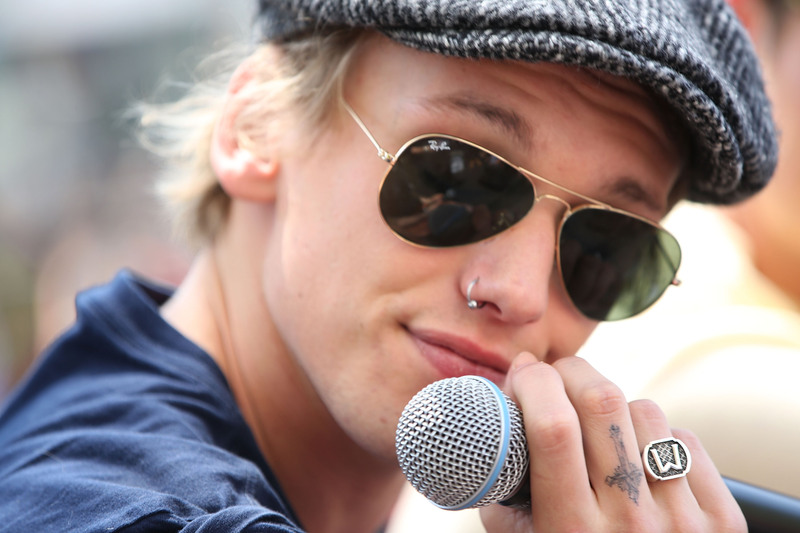 Chances are, you haven't heard of Jamie Campbell Bower, who stars alongside Lily Collins in the upcoming YA adaptation of The Moral Instruments: The City of Bones. Maybe you recognize him — he has one of those faces that you know you've seen, somewhere, but can't quite place — but you probably don't know his name. And so discovering that his movies have made about $3.5 billion dollars at the box office probably comes as a bit of the shock. Yet it's true: Bower, 24, is one of the most profitable young actors today, thanks to small but important roles in Sweeney Todd (as Anthony Hope), the Twilight series (as Caius Volturi), and the Harry Potter series (as Gellert Grindelwald). And except for a year-long engagement to Potter star Bonnie Wright that ignited the wrath of the series' more passionate fans, Bower's stayed relatively out of the press. He's worked steadily since 2007, but in supporting roles, and the enormous prominence of his Twilight and Potter castmates has overshadowed any chance he had of earning a "breakthrough" title. Mortal Instruments might change that, though; With a large-but-not-grandiose $60 million budget and a sequel already in the works, the movie is likely to find enough success to launch Bower into franchise fame. Bower won't be the only one to benefit from City of Bones' likely success; co-star Lily Collins, who's currently better known for her famous pedigree and Twitter-inspiring eyebrows, is on the verge of stardom, but could definitely use a push over the line. It'll be Bower's rise to fame, though, that'll prove most interesting, due to his already-impressive resume. He's shown that he can hold his own alongside franchise stars like Daniel Radcliffe and Kristen Stewart and make a nice buck for himself while doing so, but can he lead a big-budget movie on his own? And if the Mortal Instruments series exceeds even the highest expectations and achieves Twilight-level fame, will Bower encounter the same level of media attention and fan passion as his former co-stars? Only time will tell.